We Americans have a broken-heart, tough-love relationship with trams. We used to have the largest tram network in the world, and our nostalgia runs as deep as Mr. Roger's fabled trolley, but we lost most of tram kingdom after WWII to car and oil politics. Our loss was so traumatic that we can't even figure out what to call trams now, instead using three different words for variations of the same thing - streetcar, trolley, and lightrail. The first two are old-timey words for in-city vehicles, and the latter a lexically weird reincarnation of our old larger interurban trains that traveled longer distances between cities, as shown here in Oakland. But c'mon America, just call all 'em trams like the rest of the world! There are some minor differences in weight and speed of American lightrail from modern European trams, but most inner-city US lightrail, like Boston and San Francisco's, could be replaced by modern trams if we didn't overbuild them to satisfy arcane Federal Railroad Administration regulations. American attempts at new trams in the last 40 years have been fraught with misunderstanding. The biggest perpetrators of the mess, besides 80 years of pro-car, anti-rail actors, are urban and transit planners themselves, who can't seem to accept that Europe has had modern trams figured out for decades, and countries like France are happily adding new lines to dozens of cities, including Paris. Many planners get lured into believing that trams are simply long buses with the headache of overhead wires and iron tracks (so c. 1800!) This is in some part due to Curitiba, Brazil's success in the 1970s with using buses to simulate a metro system when the country couldn't afford underground rail. Many American planners mis-learned from Curitiba's BRT (bus rapid transit), believing it to have a better ROI than trams and represent smarter long-term planning because it doesn't need tracks. But that belies what trams are that buses never can be. 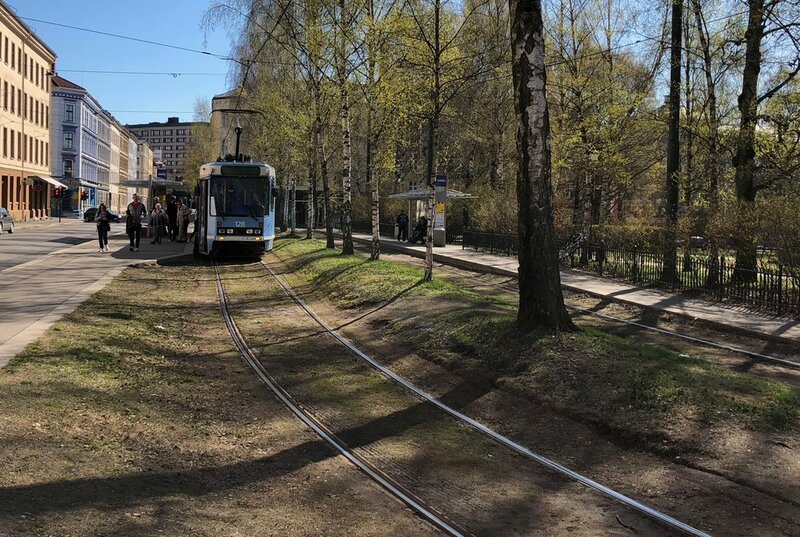 As tram advocates argue, trams are more powerful placemakers because putting tracks in the ground gives a sense of permanent transit quality to residents, shopkeepers, and developers that a painted bus lane cannot achieve, even with fancy bus stops. Trams in Tours, France make public life. Trams are really railroad trains that magically slide through crowded city streets. Modern trams are as long as a city block and can glide a thousand comfortably-seated passengers per minute - plus a few hundred fairly happy standing ones - through the densest places without any significant danger or obstruction to the throngs of people on the sidewalks or in plazas. You never have to worry that you might unexpectedly be standing in a tram's path, unlike a wobbly bus with a steering wheel. The tight form factor of trams on tracks actually blooms beautiful streets that attract people and business. Trams in Oslo, Norway, thread gracefully around local parks. Much like Mike Judge's Office Space and Silicon Valley (hey I'm a programmer), something really hit home for me while I was jogging along Oslo's river path crowded with pleasure seekers and bustling cafés on the upper banks. I got to thinking, "Why can't all our streets integrate people, nature, and commerce the way a river stroll can?" The problem is of course those pesky vehicles. It's what can make streets feel more like you're playing a game of Frogger than carelessly wandering along a narrow Garden-of-Eden-like path. Luckily, everything changes if we only allow vehicles on tracks. Wait wait, what about the hyperlOOpObusOmatic! Autonomous bus prototype in China. Now the major transit geeks among you who haven't already said something dumb about the hyperloop (I also have my new cryptocurrency to sell you), will eagerly tote the recent Chinese demonstration bus that uses sensors to stay on a painted line, oddly chaperoned by a dude with a steering wheel. This novelty act allows for a tram-length vehicle to run on rubber tires. It's the smart-city movement at its finest myopic self-glorification. The humble tram is already extremely modern and 10x easier to automate than any bus, all while promoting high-quality urban life. This copycat seeks to supplant trams - without solving any real problem. It's true aim is more likely merely to proclaim "We did it first, whatever it is!" Missing is the simple fact that tram tracks are boringly routine to install, visibly reassuring to pedestrians and travelers, and provide a more comfortable ride than articulated buses, especially as the pavement degrades under a massive vehicle. If the permanency of a tram line does indeed influence property investment (of course it does), why make a fancy bus in order to alter the line someday? Even in the exceptional circumstance that a rail line needs to move within the century, there's probably much more expensive construction going on that dwarfs the cost of the moving the track, especially since overhead wires are vanishing with modern batteries. Hey, let's all make the same mistakes and blame the tram! A free-for-all tram lane in Seattle, WA. Maybe this guy is picking up passengers. So why the hesitation? In addition to resisting trams, American planners also have three terrible habits of 1) allowing cars to share tram lanes, 2) putting stops too close together, and 3) forcing trams to both stop at stop signs and not using simple technology to change traffic lights as they approach (I'm looking at you SF MUNI N-Judah Line!) Where I presently reside in Oslo, the trams tend to take about 90 seconds to go from being fully stopped at one scheduled stop to the next, including their dwell time at the stop. They rarely waste any time stuck behind Oslo's relatively few cars or at red lights, although full signal priority is obnoxiously not yet completed. (Since Oslo's streets are narrow, signals can change almost instantly without stranding street-crossers.) All in all, trams travel about 60 satisfying seconds between stops and the rest of the time is spent exchanging large volumes of passengers at significant places. Oslo also has a great bus system, but there's a je ne sais quoi preference for living in neighborhoods on a tram line and for catching the tram, even when both bus and tram services cover the same route. That quoi is the magic of how trams seamlessly enhance place. They provide the most luxurious way of moving in a shared container with hundreds of friends through the main arteries of the city without denigrating either traveler or place. They are intimately part of the urban scene - not destructive like cars or clumsy like buses. At State of Place, we carefully consider all the things that make places great, and use research-based methods to quantify both the obvious and subtle. I don't think there's anything subtle about the importance of trams to cities. To me they are fundamental to making great places, and any city without them, such as my hometown Oakland, CA and car-clogged New York City, should take a closer look at Oslo to see what they're missing. Want suave streets with trams? Let us help! Older PostOaks, Bulls, the Queen?